It is wonderful to see so many from our public media family all together in this ballroom – station leaders, board members, donors, members of the PBS and PBS Foundation Boards, CPB, APTS, APT, NETA and our other partners. Thank you for giving up so much of that most precious of resources, your time, to spend the next couple of days imagining the future of this extraordinary public television system. And thank you to WTTW, WYCC, and our sponsors for making this meeting possible. This is my eleventh Annual Meeting address. As I look out into the room today, I’m energized by how many new faces we have in the crowd. There are many young leaders in this system who are eagerly putting their mark on our work. And there are many who have been in the system even longer than I have, who continue to amaze with your willingness to embrace new ways to deliver on our mission. 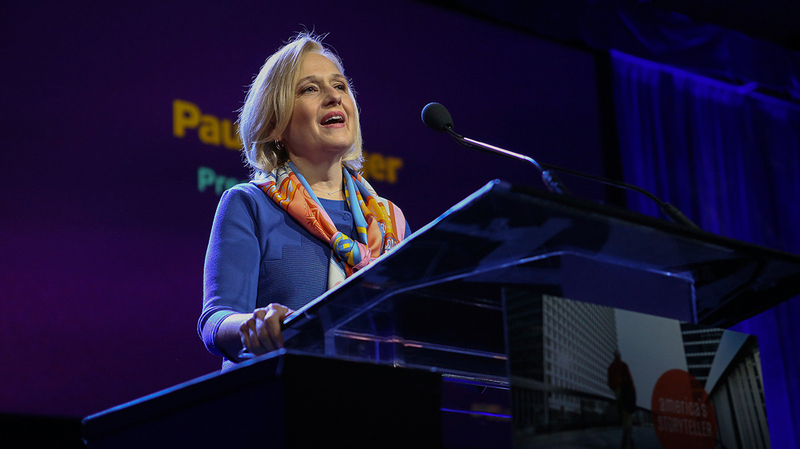 As I reflect on all that we’ve accomplished together in the last ten years, I am struck by how far we’ve come, but also by how carefully we’ve stayed true to our mission, which is now almost five decades old for PBS and for some stations like WTTW more than six decades of service to the community. When I gave my first address from this podium ten years ago, I quoted from Edward R. Murrow’s inaugural address when WNET first went on the air. Today, Murrow’s eloquent words still guide us. Even as the technological future comes rushing at us at dizzying speed, our fundamental mission is the constant star by which we continue to set our course. We have incredible, iconic series like the NEWSHOUR, FRONTLINE, NOVA, NATURE. Some of our series and producers are marking major milestones this year, with MASTERPIECE celebrating 45 years of great drama, LIVE FROM LINCOLN CENTER marking its 40th anniversary season, AMERICAN MASTERS celebrating its 30th birthday and INDEPENDENT LENS and CHARLIE ROSE both celebrating their 25th anniversary this year. Together we have done groundbreaking work calling attention to the most pressing social issues of our time, from apartheid to gun violence. We’ve showcased important scientific findings, using our platform to shine a spotlight on the science of AIDS while it was still a taboo topic. We’ve developed groundbreaking children’s shows that have revolutionized the ways that we use technology to teach children. In short, we have been our nation’s storyteller, using our platforms to reflect and remind our viewers of our shared history and our common future. In the past ten years, we’ve expanded our mission across platforms, capturing the potential of new technology to further our reach and mission. Ten years ago, I remarked on how quickly the television landscape was changing. To think that Apple’s announcement that it would sell episodes of “Lost” and “Desperate Housewives” on iTunes for $1.99 apiece was the height of innovation! And ten years ago, we were anticipating the changes that would come following Disney’s announcement that it would stream shows for free on its website. Ten years ago, I said that when technology renders the traditional television schedule virtually meaningless – when “what’s on” becomes “whatever you want, whenever you want” – when technology frees viewers from the shackles of their traditional television habits – quality content would become the key factor in choosing what you watch. And in fact, that is what has happened. Ten years ago, we’d never heard of a place called “Downton Abbey,” and we had no idea of the opportunity this would create for us in public media. Because of our commitment to quality content and good stories well told, as represented by Downton, for the second year in a row, we have retained our place as the fifth-most-watched television network, behind only ABC, NBC, CBS, and Fox. Ten years ago I urged us to take steps to ensure we remain a choice for consumers in the digital age, no matter how they choose to access our content – via television, the web, cell phones, virtual reality, augmented reality or some other form of access that has yet to be invented. And in the past ten years, we’ve certainly done that. In total, Americans viewed more than 5.1 billion videos across all PBS digital platforms in 2015, a new record for PBS. In addition to making our broadcast content available through new distribution platforms, we’ve also been focused on producing content that will uniquely appeal to viewers on digital platforms. And we’ve extended our reach into classrooms. Ten years ago, it was a dream to think that we could make the enormous library of public television programming available for educators, students and lifelong learners. More than 1.8 million educators and users have registered with PBS LearningMedia, impacting an estimated 40 million students nationwide. This was a longtime goal of our system, and through the work of so many, it’s now a reality. I’d like to thank everyone in this room, the lay leaders of PBS, our Foundation and our stations as well as the foundations and funders that make our work possible, for all that we’ve been able to accomplish over the last ten years. When I first took this stage as President I urged us to see the potential for public media as we looked forward to a rapidly changing future. Indeed we are at a very similar moment now. The media landscape continues to change dramatically. Hulu just announced that they are developing their own skinny bundle of cable and network channels, which it will sell directly to consumers. And NBCUniversal and Snapchat just formed a new partnership to let the social media powerhouse feature content from the Olympics. In this changing landscape, if we are to continue to fulfill our vital mission, we must recommit ourselves to what makes public media truly unique: our commitment to serving our communities with distinctive, educational media content. As we look forward to the next ten years, we must stay true to our core principles. - Put education at the center of our work. Let me touch briefly on each of these areas. First, of course, is content. Our content will continue to distinguish us from everyone else in the media landscape, and make us a destination for viewers who are in search of something different than commercial media, which too often feels like an extended product placement opportunity. We are focused on being America’s window to the world, providing essential high quality content that reflects our country’s diversity and changing demographics. We strive to share content that fulfills our mission to educate, entertain, engage and inspire. We share stories of cultural significance, rooted in scientific and historical fact. We inspire creativity through the arts and provide background and analysis in news and public affairs. Above all, we entertain. We are uniquely positioned in the media landscape to be a leader across the majority of our content genres. As we look to the future, we must focus on representing the wide variety of stories and experiences that make us all Americans. This means pursuing diversity not only in the stories we choose to tell, but behind the scenes as well, ensuring that our producers and system leadership reflect the many experiences and viewpoints of this country. Shonda Rhimes recently expressed this beautifully. This is a powerful way to think about our role as storytellers. And so as we think about representing the many voices of this nation, let’s pledge to make sure that what’s on-screen truly represents this great country. We have other important work in front of us as well. As public media, we have an imperative to help Americans engage in thoughtful conversations about the future of our country in our news and public affairs work. It’s clear that in this election cycle, our citizens need us more than ever. The divisions between red and blue, and the have’s and have not’s, have never been deeper. And the opportunity for people to only seek out news that confirms their point of view makes these divisions even more dangerous. As are news organizations who forget they are not in the entertainment business. We are clearly seeing the consequence of that profound confusion. In order to move forward, our country must come together to address some of the very real challenges facing our nation. Public media can and should be that place of common ground: a destination for people looking for thoughtful information. And our public media stations can and should be encouraging these conversations at the local and national level, to talk about the specific issues facing your community, and our nation as a whole. I believe that localism is at the heart of our work, and I believe that’s even more important today than it was ten years ago. It’s not just the atmosphere around the election. At a time of unprecedented media consolidation, we are some of the last media outlets who are focused on serving local needs. This was brought home to me last year by the work of South Carolina ETV, following the terrible tragedies facing the state. Last summer, following the shooting at Emanuel A.M.E. Church, South Carolina ETV, in partnership with WETA and WGBH, created AMERICA AFTER CHARLESTON, to bring the community together to discuss and to heal. Just a few months later, South Carolina ETV once again stepped forward when the community was hit with record floods, serving as a destination for families to find where to get help, and to connect with local resources. I know from my time at WNET, and specifically our work after 9/11, how important it is to use our platforms as a place for the community to gather during times of crisis. And I’m so proud of the work that you each do, not only in times of crisis, but in times of great change, to connect your communities together. I think that the South Carolina example illustrates something more profound about the importance of our local stations. When I talk about localism, I’m not just talking about local productions. I’m also talking about the ability of each of you to work with national partners, and choose the national programs that best fits the needs of the viewers you serve. The town hall event was a success because of the local relationships South Carolina ETV had built, but it was also a success because of the collaboration with WETA, WGBH and PBS. The new digital landscape demands that we must take advantage of every opportunity we have in order to deliver impactful content to our audiences, by leveraging the strengths we have as a system, and the unique relationships you’ve built over your decades of service to your community. For some, it’s easy to look at the changing landscape and liken it to a tsunami, sweeping away everything in its path. But I think of this new digital landscape differently. As delivery platforms and viewer behavior changes, and as we embrace new digital tools, our mission to serve local communities is strengthened, not weakened. As more and more media providers focus on click-bait, we are more unique and essential than ever in our focus on impactful content. Our ability to connect with local viewers, and deliver content and information that matters to them, is reinforced by new digital tools. As you saw with the PBS.org redesign, we are committed to using new platforms to deliver audiences to your doorstep, and building traffic to your station sites. We can now reach audiences on their terms, making entire libraries of content available with a few keystrokes. And we can integrate local and national content, so that people can find the stories that matter to them, about their own neighborhood and their own community. The potential to use new digital tools to deliver support for our system is an exciting evolution. We’ve begun this process with the launch of Passport, and we’re going to continue to build on the new possibilities that digital philanthropy offers to connect your stations with supporters. Finally, we must continue to put education at the heart of our work. Education is what sets us apart from everyone else in the media landscape. It’s why we were granted our broadcast licenses. Truly, education is why we exist. As we look ahead, we must continue to make education a fundamental part of our work. And while we’re focused on how we can meet the needs of all children, we are uniquely positioned to ensure that those who don’t have access to other resources can use our research-driven content to prepare for success in school and in life. Our new 24/7 KIDS services are an important step forward in our evolution. It will help stations make PBS KIDS content available during peak TV viewing hours, especially critical for children in homes without access to cable or computer. An important effort in bridging a growing digital divide. Alongside the broadcast reach, stations will also be able to offer the service on digital and mobile devices via a 24/7 live stream. Our vision is to build interactivity into the live stream so kids can seamlessly move from video to games, VOD or other interactive features while they are watching the live feed. Together, all of the experiences we are building will ultimately merge for the very best, seamless child and parent experience, delivered by our local stations. And, of course, this will be the only free 24-hour children's service on television, providing stations with yet another important way to reach the most vulnerable members of their communities. To succeed in this new landscape, we will be focused on putting content, station engagement, and education at the heart of what we do, and on providing the infrastructure our system needs to continue to thrive. Ten years ago when I accepted this job I said that now, more than ever, our country needed a strong public media system. We all proudly share this name, PBS, which we have built together. It is truly time that we firmly unite local/national, urban/rural, large/small. Because, my friends, there is a lot at stake and we cannot afford to waste even a single moment in internal debate while our country needs us. We must provide the forum for thoughtful conversation around the critical issues that effect us all. We must offer our viewers the chance to see new worlds and new possibilities and to again feel a sense of hope for our future. The last ten years have only deepened my conviction that our work is vital and essential and our brightest days are still to come. But this is only possible if we do not fritter away the opportunity to seize the moment, take risk, and bind ourselves tightly together towards this common mission and purpose. As we chart our course through the next ten years, I hope that we will remember the power of our medium and the responsibility that comes with it. It has been my honor recently to commemorate the work of some of our industry’s greats, those that laid the groundwork for our work today. From Edward R. Murrow to Fred Rogers, the luminaries of this industry continue to guide us from above. This year we lost some great leaders of public television, from those who appeared on our air including Wayne Dyer, producers behind the scenes like Bill Grant, to dedicated lay leaders such as Elsie Hillman, to industry leaders such as Dan Metziga and Zvi Shoubin to partners such as Tracy Carter and four members of my PBS team: Charles Coates, Scott Dumond, Steve Friedman and Marc Mangum. Let’s pause a moment to remember all of our public television family who are no longer with us. As I think of all who exemplify dedication and commitment, I personally gain inspiration from those visionaries on whose shoulders we all stand. From my first days at PBS there has been one individual who stands above the rest, one who set out a vision for what media can and should do. Newton Minow, whose foundational work as chair of the FCC, and as a leader at WTTW and at PBS, inspires me every day by his decades of service to the American people. And so today, in the hometown of this great man, I want to close my speech by offering to you some of the guiding principles he laid out, which have defined our work since PBS was created. Today, I would add to that list the digital age. More than five decades later, that is still our challenge. Can we use the tremendous technology at our fingertips to rebuild the world for mankind’s benefit? And can we use our powerful voice to enrich the people of this great nation? Working together I’m confident that we will use the power of technology to reach into every community in this country. Together, we will offer all Americans a refuge and a resource to learn and engage with their world. And together, we will give every American the chance to realize their dreams and their potential. We share an obligation to the great leaders of the past, but I am confident that through the work of the visionary leaders in this room today, our future is indeed brighter than ever. I hope we remember how fortunate we are, in this time of tumult and, for some, loss of belief in the American dream, that we have the opportunity to actually make a significant difference in our communities, our country and our world. It is my great privilege to work alongside you in pursuit of this extraordinary vision.